How Can You Maintain Security at all Times? Picture the following: You just retired with $1,000,000. 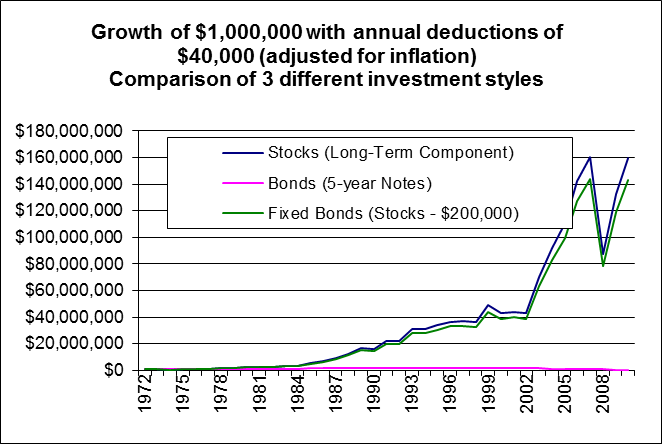 You require $40,000 in gross income for your living expenses, growing with inflation, and you would like to choose between stocks and bonds. Let’s further assume that the year is 1973. You don’t know it yet, but the worst stock market crash in recent history (since 19701) is right around the corner. Note that you could be 45, 65, 85 or any other age. In all cases, you want to make sure you have money for as long as you live. To have a concrete example, we will assume you are 65. The graph below will compare your portfolio value for ages 65 to 90 and on. You wish to stay safe, so you choose between a bond portfolio of 5-year treasury notes and a globally diversified stock portfolio: Long-Term Component by Quality Asset Management. Stocks vs. Bonds: As shown in the graph below, even when starting the comparison right at the beginning of the worst market crash in recent history, the stock investment had increased security over the years, while the bond investment was headed for depletion. The stock investment was clearly better. Nevertheless, you might ask yourself: What if I get terribly sick very soon and I need a lot more than $40,000 per year? You don’t want to leave much to chance, and want extra short-term protection. Fixed-Bonds Approach: Consider the following: You keep 4 years of living expenses in bonds. For as long as your stock portfolio goes up, you keep selling enough of it to keep your bond reserve at 4 years of living expenses. With annual expenses of $40,000, this would mean $160,000 in easily accessible bond reserves. Whenever the stock portfolio declines you live solely off the bond reserve. Only after full recovery, you sell stocks at a profit to bring the bond reserve back to the long-term level. Short-Term Security: With the fixed-bonds approach, how much money would you have lost during the awful recession of 1973-1974? Absolutely nothing! The bond reserve will supply you with enough money to go through the worst recession seen in 4 decades, without any losses. The portfolio value will decline on paper, but since you will not sell any of it, you will not realize any losses. As soon as the recession is over, you sell enough stocks to bring the bond reserve back to 4 years of living expenses adjusted for inflation, while realizing gains on the stocks sold. Long-Term Security: How did this portfolio perform over the long run? Similar to the all-stock portfolio: It grew out of control . With $143,000,000 in 2010, money is not an object for any of your desires. The Constant Match: By keeping a constant number of years of living expenses in bonds and not the traditional set percentage (e.g., 16%), this component keeps matching your short-term security needs. Whenever an awful recession happens, you will be ready to go through it without realizing any losses. During a recession, you would have to sell stocks at a loss. The only reason to have the bond component is to minimize or even eliminate losses in the stock investment. By selling losing stocks, you miss the point and lose the security you desire. In addition, as the stock portfolio grows over time, you would end up with more years of living expenses set aside in Bonds. This money would unnecessarily grow much slower, and would decrease your long-term security. If you examine things more thoroughly, you realize that the rapid growth in the stock portfolio also increases the short-term security. It is much easier to take $40,000 out of $10 million, than out of $1 million. Question: Can you guess what percentage of the portfolio was in Bonds in 2010? Answer: 0.57%. This is a fraction of the initial 16%! Question: Do you think that this investment is more aggressive than the 16% bond approach? Answer: No! It is actually more conservative. The bond component is worth $815,000, which is the same as $160,000 in 1973, providing for the same 4 years of living expenses. This provides for the same level of short-term security. In the meantime, the stock portion grew to $143,000,000, or $28,000,000 after adjusting for inflation. This is 28 times more purchasing power than the initial investment. The long-term security just multiplied by 28! Every year of your living expenses dropped from 4% of your portfolio to a mere 0.14%. The total effect is a large increase in both your short-term security and long-term security. Any violation of these requirements would increase the risks and usually reduce the returns. In addition, even though the worst date to retire in the last 40 years was picked, the future could still be worse. Note that the amount of money that should be left in bond reserves is very individual and depends both on the size of any unexpected short-term needs and on strict adherence to the plan during all temporary declines in the portfolio value. Constant reviews of the plan are required as annual living expenses and other factors might change over time. 1 The 2008 decline was worse, but was too recent for tracking its long-term effects. Given that it was very limited in time and nearly recovered by the end of 2010, you can anticipate results consistent with the 1970 decline. Should Higher Earners have Higher or Lower Saving Rates? How Much Should You Spend? A Rule of Thumb for All! Your Neighbor’s Grass is Brown! Do Rising U.S. Interest Rates Hurt Emerging Markets?